The Michael Kors Rehearsal Shopper Bag is a must-have because it looks very multi-functional. 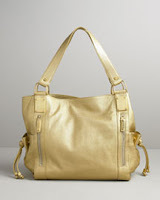 This bag is made from sleek, gold leather which can give it away to an evening out, classy or party function and its size makes room "literally" for it to be taken on the upcoming 2008 cruise. And of course, if you decide to take it on the cruise with you, you have to buy the Michael Kors Babe Python Thong Sandal in gold to match. The Rehearsal Shopper Tote retails at $1495 and the python thong sandal costs $550. All of the displayed items can be purchased from the Michael Kors online store.